Previous Article What is uniquely human? I think it’s more a matter of implementation. 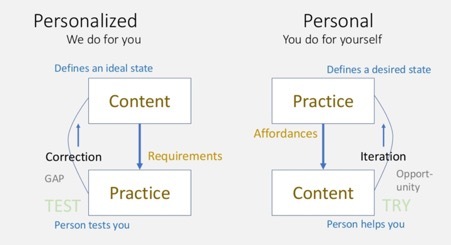 You can use xAPI to increase learner autonomy. Alternately you can decide to implement it in a way that has nothing to do with learner autonomy. In terms of our own work at Yet, we’ve worked with clients taking either of these (and other) approaches. xAPI was developed at Advanced Distributed Learning. It’s designed for distributed data. Note that distributed data does not necessarily have anything inherently to do with choice, ownership, and community — for instance, some large corporations implement distributed learning solely for the purpose of compliance. Again, how a technology is implemented is the thing. Depends on the implementation. For example, certain types of employee records are often owned by the company on account of IP matters (for example, where training data could be used to reverse engineer proprietary methods). As with any online communication technology — there are privacy, governance, and security issues related to implementation. Some of these issues are technological in nature, others are policy in nature. Completely depends on implementation. You could track whatever activity you like. If the activity contributes to a digital footprint, you can track and measure it. The question should be: what are you trying to measure and why? Thanks for this post. I apologize in advance that so many of my responses basically say “matters on implementation”, but that’s sort of the nature of almost any data specification. Hi Shelly – many thanks for taking the time to respond to the questions in this post, and more importantly for correcting my errors, for which I apologise. Also thanks for posting the link to the report.